I don't just dislike worksheets. I literally hate them. I have no choice about using them in some cases. We are required to use the math worksheets that come with our math curriculum. I do everything I can to make them quick and engaging. That is about the only time you will find my students doing a worksheet. 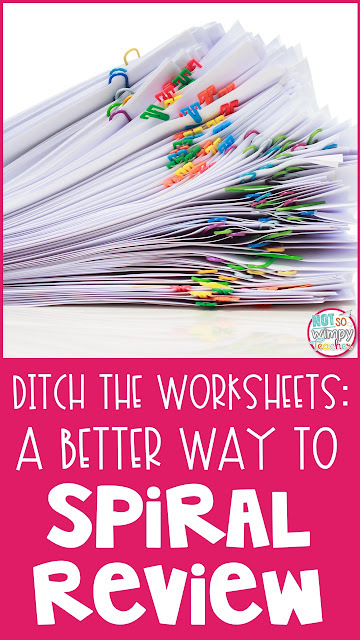 Ditch the spiral review worksheets. Why ditch the spiral worksheets? A list of questions that students have to sit in their seats and answer just isn't fun! And what's worse? I was using my spiral worksheets as my bell work. It was the first thing that students did when they walked into my classroom. It set up their day. And I was boring them to tears. Not good! Spiral worksheets don't match our pacing guide. It is HIGHLY unlikely that any spiral worksheets that you will find will match the order that you are teaching the skills. Therefore, it's not really a "review." My kiddos would feel frustrated when they were asked a question that we had not yet learned. I would find myself doing a quick half-hearted lesson when we were really supposed to be reviewing. The worksheets can be a time sucker. Students need time to complete the daily problems. Then you need time to go over the answers together. Then you need time to reteach or introduce the skills that your students had never seen before. What started as a simple five minute activity, can easily turn into a 20-30 minute activity. How should I spiral then? I am not suggesting that spiral review is a bad thing. I strongly believe in spiral review. I love to teach in units of study, but if you never come back to the early skills, students will forget. We remember what we do repetitively. I just think that their are better ways to spiral then just giving a worksheet. Build spiral review into your centers and small group time. The best part about using small group and center time for spiral review is that you are able to differentiate the review! Every student doesn't need the same thing anyway. During math centers, my students have a rotation that is completely based on review. Since they are doing review activities, they are able to complete them more independently. When they are struggling, we can work on the activity together during our small groups. During reading centers, my students have a rotation that includes spiral review through reading response. Give students engaging review activities rather than worksheets. Give them centers. Give them games. Give them projects. Get then up and moving around! I use my math center sets as my students' math spiral review. They are engaging and fun. My students like to do them. To make it a review, I give them a skill that we have already covered whole group. For example, they won't do the multiplication set until we have finished the multiplication unit from our curriculum. I love to use task cards in my classroom. We do at least one task card scoot every week. It is part of our grammar routine. The kids love getting out of their desks and moving around the classroom as they answer the questions on the cards. Task cards can be used for super quick spiral review too! It really helps me to get more bang for my buck after prepping these task card sets. I keep a few sets of task cards that we have already done whole group (or didn't have time to do whole group) on my table or counter. If we happen to have a couple extra minutes before recess or specials, I grab a few of the cards. I will read the question aloud and call on a student. If they answer it correctly, they get to get in line first. We continue until our time is up and the rest of the class joins to line to leave for specials. Look for natural times to review during lessons. Spiral review does not always have to be an extra activity that students must complete. It can be super quick additions to your current lesson. 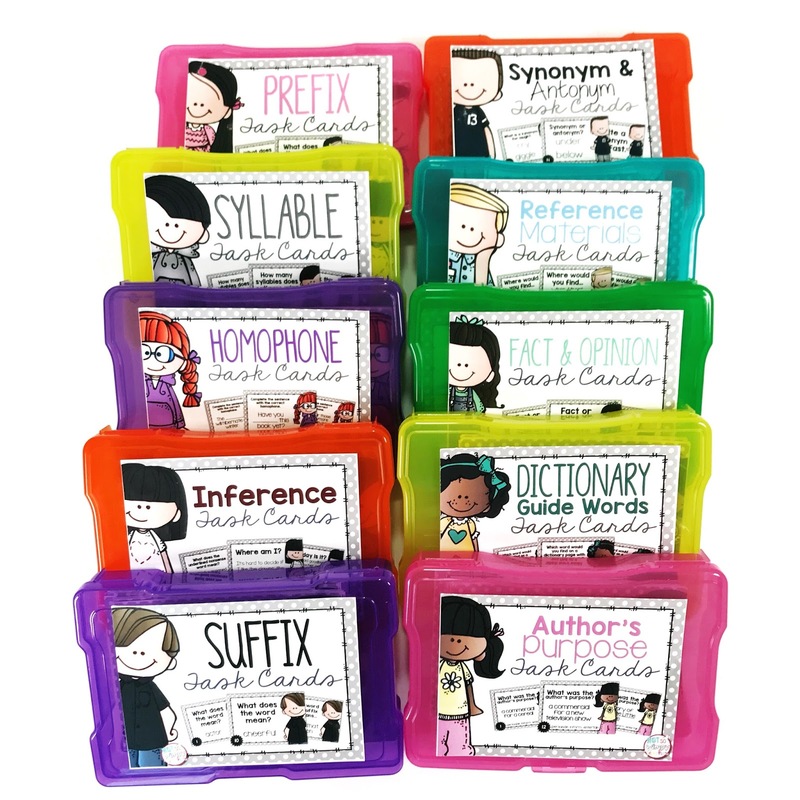 For example, when I am teaching students about adjectives, I also have them point out the nouns and verbs. Later, during guided reading groups, I can point to one sentence in our book or passage and ask them to find the adjectives. The same can be done with math. Students are finding the area of a rectangle. Ask them what they know about rectangles to review geometry. Throw in multi-step word problems so that your students have more opportunities to practice addition and subtraction even during your multiplication unit. They need the repeated practice. I didn't have to prep anything else and it takes just an extra minute or our time. Simple! Use price of admission when students are entering the classroom. I love this quick and simple activity! It is similar to an exit ticket, but no copying is needed and it happens as kiddos are entering the room. I print THIS sign, laminate it and staple it to the wall next to my classroom door. I use a dry erase marker to write a question each day. It is best when the question is a yes/no question. It is even better when there is more than one correct answer. Give me an example of an adverb. What is one ingredient needed for photosynthesis? What was one cause of the Civil War? What is one way to make a noun plural? My questions come from prior lessons and let me see what students remember and what they need to review. My only rule is that you can't give the same answer as the person in front of you in line. If it is a question with just one right answer, have students whisper the answer in your ear. If a student doesn't know the answer, I have them go to the back of the line and I tell them to listen real carefully! They usually have a correct answer by the time they get to me again. If lots of students get the answer wrong at first, I know we need to review during small groups! You can also use this activity to get to know your students better. Once a week of so, ask a personal question. I just love learning little details about my students. It helps me to really connect with them in the classroom. What do you think? Can you take me up on my challenge to ditch the spiral worksheets?